The workplace. What was once little more than a depository for desks and chairs is now a hub of collaboration and innovation; a place where ideas are shared and problems are solved. Today’s workplace impacts employee wellbeing and performance, delivers brand impression to customers and attracts top-notch talent. And with so many of us spending so much of our lives there, it’s vital that the workplace experience be as exceptional as it can be. At QGC Interiors that has been our mission for more than 20 years – to create a better workplace experience for each of our valued clients. Whether you’re a five-person startup in a loft downtown, or a Fortune 100 company with locations across the country, we have the experience and industry expertise to meet your needs and exceed your expectations. 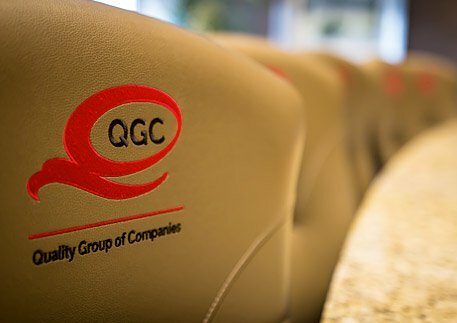 When you partner with QGC, you enlist a team of skilled commercial interior designers and industry experts. We have a deep understanding of prominent design trends and a commitment to collaboration and communication that will ensure your project – large or small – is a success. We have relationships with over 200 product manufacturers to provide furniture and furnishing options that align perfectly with your unique design goals, your brand image, and your budget.